Ministry of Propaganda - 20/Sep/2004: "Sunday Walk on Tan Hill Way"
After a fairly grey and rainy Saturday (apart from the late afternoon, but by then it was too late) the weather wasn't too bad on Sunday afternoon, so I went for yet another Sunday walk. I started my walk at Oare near Pewsey. Having parked near the school I made my way up Huish Hill, where I joined Tan Hill Way. I then followed Tan Hill Way westwards until I reached Knap Hill. From Knap Hill I had a nice view over the Vale of Pewsey. Unfortunately visibility wasn't too good, on a clear the view must be even better. Turning north east I walked over to the Wansdyke Path. Following the path I walked to where my map indicated the site of the medieval village of Shaw. Apart from some earthworks there is nothing visible of the village any more (It seems it was abandoned more than 500 years ago). 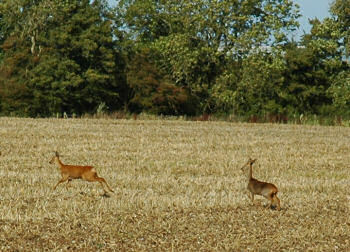 Near Shaw I saw some deer on a field, unfortunately they ran away quite quickly. 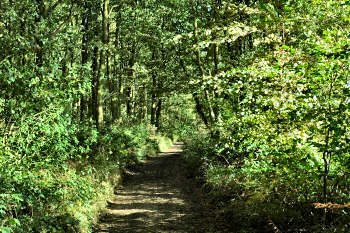 Continuing along the Wansdyke Path I walked to and then through West Woods. The path follows the southern edge of West Woods until the end of Strawberry Ground, from where it continues through West Woods. Here I turned off to continue following the southern edge of the woods until I reached Bayardo Farm. From the farm I walked south to return to Huish Hill and then walk down the hill to Oare.